The William Henry E10-1 is a great everyday pocket carry folding knife that keeps both outdoorsmen and working professionals in mind with its build and looks. With an overall open length of 7.50 inches and weighing only 1.6 ounces, the American-made knife is a comfortable length for every day work. The blade measures 3.5 inches long and is made with strong and durable M390 stainless steel. With the black tungsten carbide coated finish, the blade reduces any glare from light. The spearpoint blade allows for a large range of uses, including cutting, slicing, and piercing with great ease through various types of substances and materials. The thumb stud and one-hand button lock system allows for easy, smooth, and quick deployment of the blade at any moment. The handle fits comfortably in hand, measuring just a bit above 4 inches. With the handle's 3d machined grooves along the aircraft-grade aluminum build, it provides added grip in slippery environments. 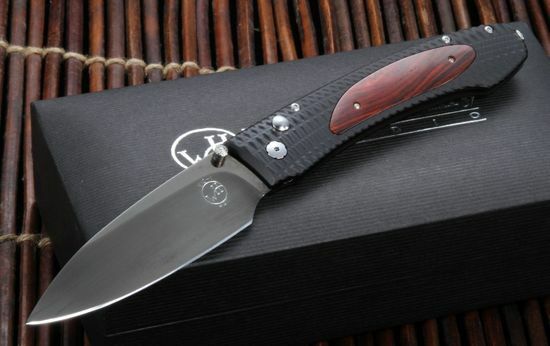 In addition, the handle features a beautiful inset of cocobolo wood. The EDC knife comes with a reversible stainless steel pocket clip that allows for carrying at your convenience. And the hard-anodized handle makes this a knife that measures to military specs, ensuring its strength and durability. Overall, the William Henry E10 is built to withstand all types of work and scenarios, while adding a touch of class to your everyday carry gear. As with all William Henry knives, the knife you order from us will come with a certificate of authenticity, and presentation box. All orders are satisfaction guaranteed, with free and same day shipping from us at KnifeArt. My first purchase from Knifeart. Surpassed my expectations, both the quality of the knife as well as the service from Knifeart. Fast shipping in professional packaging arrived in two days! This larger knife fits the hand comfortably. As a collector for MANY years I've always desired a William Henry knife and this one did not disappoint! Very light for its size and the quality is obvious as you handle it. Hairsplitting sharp right out of the packaging. Great value for the price, buy one, you won't be disappointed! 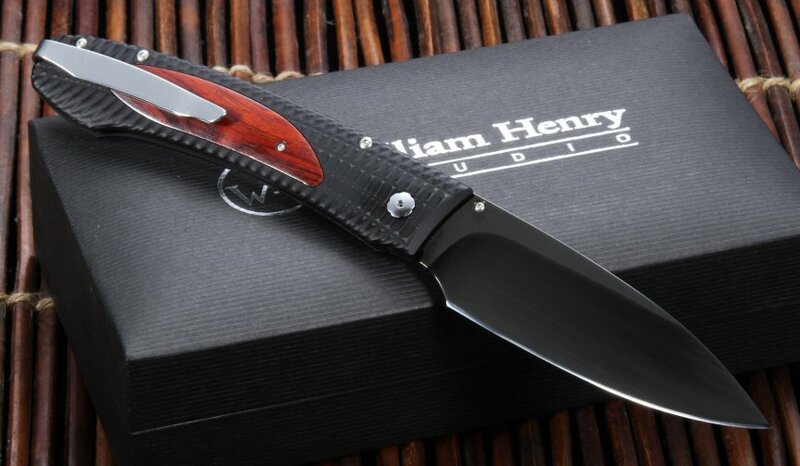 William Henry knives are truly a Work of Art. Precision and Craftsmanship unequaled in it's category. The Ultimate Gentleman's knife that can do whatever else you need done, but probably wouldn't want to do with this piece. The Mil-Spec Aircraft Grade Aluminum, M390, and Cocobola Inlay and deep carry Clip are flawless. It's so light I catch myself feeling for it in my pocket to make sure it's there, but Deep Carry Clip is locked tight but smooth to the pull. I have Sebenza's, Spuderco's, Benchmade',s Boker' Collectibles and more (Knife Addict), but I always wanted a William Henry. 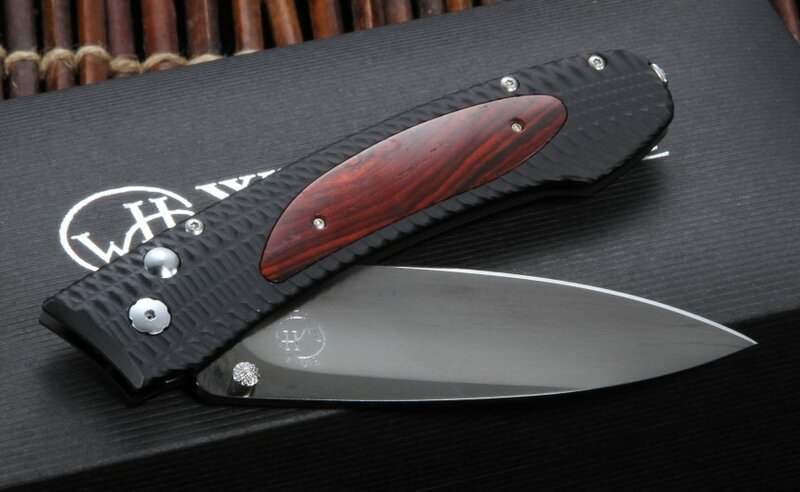 The ED10-1 is affordable for a WH and my ultimate Tux and Suit Knife. You can only buy a work of art from KnifeArt, a work of Art Dealer. Shipping is immediate and guidance for info without equal. You only live once, buy one you won't regret it. This knife is thin, sturdy, and beautiful. I removed the clip and carry it in my pocket. The D2 Steel take a great edge that lasts quite a while. The blade finish is a bit of a fingerprint magnet but I wouldn't take away a star for that. The blade shape/grind is great for most common tasks. Overall, the size, shape, and materials make this knife one that I'll happily carry anytime. I've had this knife on my wish list for a long time and finally decided to purchase. The high price for a smaller EDC knife made me delay for a long time but I can tell you that I have zero buyers remorse on this fine knife. The knife is finely made, well put together, materials looks and feel great and the blade is incredibly sharp. I love the deep carry clip though I wish it was black instead of polished. Stays in my pocket perfectly and never snags on the way out and doesn't take up a lot of room as to allow my hand to access other items in my pocket without an issue. I wasn't sold on the push button release to close the blade but it has grown on me and now I love it. The texture of the handle lends to a good grip and the wood inlay looks classy and very nice. My only complaint may lie in the thumb stud for deployment, it's a little small and close to the handle so it makes deployment a little tricky but I am getting used to that also so it is becoming less of a problem. I would highly recommend this knife for everything I have written above. If you are considering this blade don't wait months like I did, buy it, you won't be disappointed!